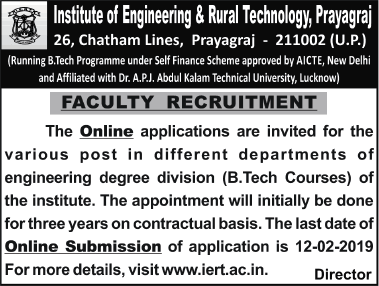 Institute of Engineering and Rural Technology, Prayagraj has advertised in THE TIMES OF INDIA newspaper for the recruitment of Teaching Faculty- Professor / Associate Professor / Assistant Professor jobs vacancies. Interested and eligible job aspirants are requested to apply on or before 12th February 2019. Check out further more details below. About College: The campus of IERT spreads over 26.5 acres of land. It has separate hostel and mess facilities for boys and girls including 24-hour generator facility, telephone, and other necessary amenities. The college has well-equipped labs with modern equipment. Its computer lab own latest computers, software and application development tools, etc. It has a sizable library, consisting of a huge collection of books on engineering and several other subjects. How to Apply: Interested and eligible candidates are requested to apply ONLINE at the following web address. The email copy of duly filled application along with duly filled PBAS CALCULATION SHEET, PBAS DETAIL SHEET, e-Receipt, duly self attested supporting documents such as self-attested copies of relevant testimonials, certificates, enclosures must be sent by speed post or registered post to the DIRECTOR IERT, ENGINEERING DEGREE DIVISION, INSTITUTE OF ENGINEERING AND RURAL TECHNOLOGY 26, CHATHAM LINE, PRAYAGRAJ - 211002 UP, INDIA failing which their candidature will not be considered. The envelope containing the application be superscribed as "APPLICATION FOR THE POST OF ASSISTANT PROFESSOR / ASSOCIATE PROFESSOR/PROFESSOR IN THE DEPARTMENT ………………………"
26, Chatham Line, Prayahraj - 211002, UP, India.